Before you bring home your first pet rabbit, make sure he has a safe place to live. While bunnies can live in small cages similar to those used for guinea pigs, a small cage is not an ideal living environment for your new pet. Bunnies are active animals that benefit from a larger living enclosure or kennel that allows them plenty of room to play and exercise. You can build a kennel for your bunny either indoors or outdoors. The House Rabbit Society recommends placing your bunny's kennel inside your home for reasons including better socialization, more daily interaction with family members, protection from the elements and protection from predators that are commonly found in an outdoor environment. 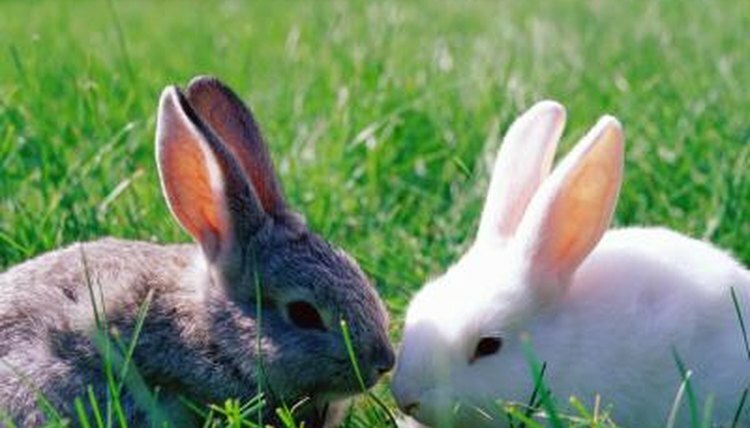 However, outdoor kennels are still fairly popular and considered normal by many bunny owners. If you choose to construct an outdoor kennel, make sure that the kennel is in a location where it is protected from the elements and predators. The Indiana House Rabbit Society recommends keeping your bunny in a kennel or cage that measures no less than 30" x 30" x 24". The larger your kennel is, the better it will be for your bunny because he will have more room to exercise and play. Your bunny kennel needs to be large enough to easily accommodate food and water dishes, a litter pan, toys and ample room for the bunny to lie down and sleep. Larger bunny kennels may have several floors and ramps that allow the bunny to climb up and down throughout the cage, which will help keep him entertained. Before you start building your kennel, decide what you want it to look like. A wide variety of rabbit kennel blueprints can be found online or you can design your own kennel based on your unique needs. Some kennels are completely enclosed while others offer outdoor runs or multiple stories to increase floorspace. Choose sturdy materials that will be non-toxic if your bunny decides to chew on them. In order to be safe, your homemade bunny kennel needs to be sturdy, secure from predators and escape-proof. You do not want rough edges or nails sticking up out of wood because your bunny could be hurt by them. Flooring and ramps should be solid so that your bunny's feet do not become trapped or stuck between gaps. Bunny kennels are primarily built using wood. If your kennel has windows or an outdoor run, you also need wire fencing. Make sure the openings in your wire fencing are too small for your bunny to escape through. If you're building your kennel using pre-made blueprints, they will tell you the exact materials needed and how much to purchase. If you are designing your kennel on your own, take measurements of each planned section and determine the materials you need. Build the kennel roof out of shingles or metal in order to prevent rotting. You will need tools to build your kennel, including a hammer, a power saw and a sander to smooth out any wooden boards which are not smooth enough. Make sure you don't have any exposed nail heads sticking up where your bunny can get hurt on them. Do not use paint on areas of the kennel where your bunny might be tempted to gnaw. Your bunny kennel should provide plenty of shade and ventilation for your bunny at all times, as rabbits can become severely overheated in a relatively short amount of time. Bunny Rabbit: How Do You Build A Rabbit Hutch?